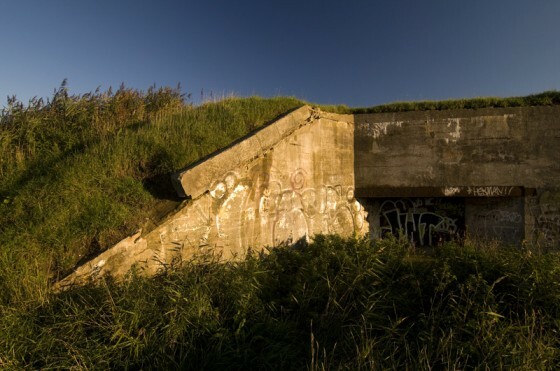 Great news for several bunker complexes in the Netherlands. Both the Landfront of the Verteidigungsbereich Vlissingen (except for the anti-tank wall in the east) and the batteries of Olmen and Heerenduin in the dunes of IJmuiden are classified as national heritage. It took over 10 years to come to this conclusion, but the persistance paid off. Stichting Bunkerbehoud and WN2000 in IJmuiden have worked years on these projects. The unique, largely intact, Landfront of Vlissingen runs through the inland of Walcheren and was originally intended to protect the important harbour of Vlissingen on the land side. Anti-tank ditches are still quite intact, and nowadays, you can take your bike and take tour along the bunkers. Both bunkers, anti-tank ditches and other parts of the Landfront are now protected. This means demolition is now far away and any modifications to the bunkers or the landscape must follow a strict set of rules. Marineflakbatterie Olmen and Marineküstenbatterie Heerenduin at the coast of IJmuiden are one of the few bunker complexes in the Netherlands which are still visible. By classifying the Dutch government accepts these remnants from a dark past. Hopefully this will lead to more protected bunkers and complexes in the future.